A new fossil discovery identifies the earliest evidence for animals with muscles. An unusual new fossil discovery of one of the earliest animals on earth may also provide the oldest evidence of muscle tissue – the bundles of cells that make movement in animals possible. The fossil, dating from 560 million years ago, was discovered in Newfoundland, Canada. On the basis of its four-fold symmetry, morphological characteristics, and what appear to be some of the earliest impressions of muscular tissue, researchers from the University of Cambridge, in collaboration with the University of Oxford and the Memorial University of Newfoundland, have interpreted it as a cnidarian: the group which contains modern animals such as corals, sea anemones and jellyfish. The results are published today (27 August) in the journal Proceedings of the Royal Society B. Historically, the origin, evolution and spread of animals has been viewed as having begun during the Cambrian Explosion, a period of rapid evolutionary development starting 541 million years ago when most major animal groups first appear in the fossil record. “However, in recent decades, discoveries of preserved trackways and chemical evidence in older rocks, as well as molecular comparisons, have indirectly suggested that animals may have a much earlier origin than previously thought,” said Dr Alex Liu of Cambridge’s Department of Earth Sciences, lead author of the paper. The new fossil, named Haootia quadriformis, dates from the Ediacaran Period, an interval spanning 635 to 541 million years ago. It differs from any previously described Ediacaran fossil, as it comprises of bundles of fibres in a broadly four-fold symmetrical arrangement: a body plan that is similar to that seen in modern cnidarians. 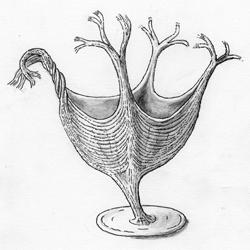 The researchers determined that the similarities between Haootia quadriformis and both living and fossil cnidarians suggest that the organism was probably a cnidarian, and that the bundles represent muscular tissue. This would make it not only a rare example of an Ediacaran animal, but also one of the oldest fossils to show evidence of muscle anywhere in the world. “The evolution of muscular animals, in possession of muscle tissues that enabled them to precisely control their movements, paved the way for the exploration of a vast range of feeding strategies, environments, and ecological niches, allowing animals to become the dominant force in global ecosystems,” said Liu. The research was funded by the Natural Environment Research Council, the Natural Sciences and Engineering Research Council of Canada, the Burdett Coutts Fund of the University of Oxford, and the National Geographic Global Exploration Fund Northern Europe.